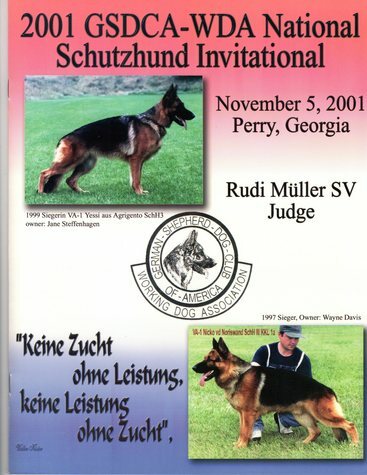 This is the program I purchased as a souvenir when I attended the 2001 German Shepherd Dog National. I intended to fill in the scoring sheet, but was too enthralled watching the dogs and handlers work. It was AWESOME! Maybe you, or someone you know attended and neglected to purchase a program before they sold out. Here's a second chance to get one to commemorate that rare event. Working Dogs of America doesn't normally combine with the parent German Shepherd Dog club here in the US to compete outside their own events.